Ypsilanti Public Schools' Board of Education listens to a budget audit presentation from Jeff Higgins and Nate Troyer of Plante & Moran at Monday night's meeting. Dec. 10, 2008 · 3:55 p.m. 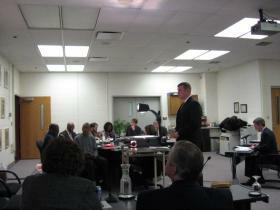 The Ypsilanti Public Schools’ Board of Education discussed the district’s dwindling fund balance Monday. The issue was presented by an independent budget audit from Plante & Moran. The audit stated the district had spent nearly $1.4 million of it’s fund balance last year. This left $579,457, or 1.3 percent, in its coffers. Kelli Glenn, the district’s acting chief financial officer, said a comfortable fund balance is normally around 10 percent. She said it is very likely that the district will completely drain its fund balance this fiscal year. A fund balance is the money set aside to fund unforeseen expenditures the district might incur. If all revenue coming into the district suddenly disappeared, a 10 percent fund balance would allow YPS to run five weeks before running out of cash. With this reported 1.3 percent level. The district estimates it could run for five days under a similar scenario. Glenn, as well as presenters from Plante & Moran, pointed to twp main caused for this scenario. They said declining enrollment and increased prices, coupled with decreasing allocations from the state, have decreased revenues to the point where dipping into the fund balance has become necessary. In addition, the district says its inability to sell its unused Ardis Elementary did not help with anticipated revenues. “We’ve essentially had to go into our savings,” Board Trustee Andy Fanta said at the meeting. Glenn said the district has been cutting expenditures to cope with the decreased revenue, but it just hasn’t been enough. For instance, information provided in this audit shows revenues were more than $5.1 million under what the district had budgeted. However, it was still able to save more than $2.5 million from its budgeted expenditures. As the fund balance has decreased from more than $3.7 million to current levels in the past five years, enrollment has dropped from about 4,400 to 3,800. The district has also lost nearly 40 teachers in that same time. If YPD does completely deplete its fund balance and enter into deficit spending, the district will have to begin the deficit elimination process with the state government. This will likely mean much more drastic cuts in the future. Glenn said the deficit elimination process will likely be started next year. “I don’t expect it to get better soon,” she said.